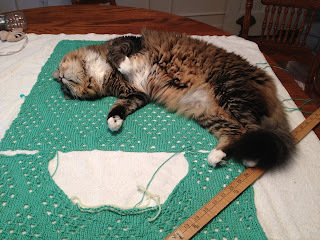 For those of you sick of reading about my knitting projects...you are S.O.L. I was going to include all the fashion-related deets of my trip to England but then I got lazy. I didn't actually buy any fabric while I was there, but I went to two fashion museums and a fashion exhibit at Kensington Palace featuring dresses worn by the Queen, Princess Margaret, and Princess Diana. It was all pretty awesome. I will post pictures at some point. Anyway, I knitted my first real full-length pullover! How exciting. 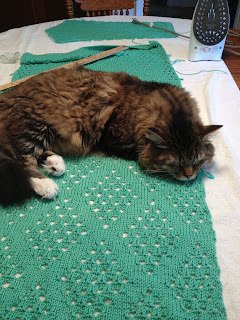 All the details are on my Ravelry Project Page. The sleeves don't look so long and sloppy in real life. They're a teensy bit longer than they need to be, but not as crazily long as they look in these pictures. I used Knit Picks Shine Sport sportweight yarn in Pistachio. I'm really into mint right now. And I'm hopping on the oversized sweater train. I like to think I'm pretttttty on trend. Sox also digs this sweater. He slept on it all day while it was blocking. He also flopped all over it. Andddd he tried to eat it while I was knitting it. What a turd. Alison this is gorgeous! I can't believe this is your first one, how is that even possible? It looks amazing and turned out so perfect. Seriously it would take me like 10 tries to get it turning out this well I swear. Great job girl! This sweater looks so good with jeans! That's a fine piece of work right there hans brolo, think i could pull it off? I love the sweater! I have a question about the awesome shoes you are wearing in this collection. I have been considering purchasing a similar pair of shoes, but I am worried they will make my feet sweat. What have been your experiences in the shoes you are wearing in this collection? Do they make your feet sweat? I am really looking forward to following your blog, Alison! I just bought them so I haven't worn them a ton yet, to be honest. But I haven't noticed too much foot sweating so far. They're wicked lightweight so I think that helps with keeping your feet cool. But they are the most comfortable shoes I've ever worn. Truly. So regardless of foot sweat, I highly suggest you buy them. I have foot issues (bunion surgery = wicked wide feet) and I have pretty much never owned a pair of shoes that really fit - and these ones actually do. When my family traveled to England last summer I honestly didn't have a pair of shoes I could walk around in all day for a week, except for my Rainbow flip flops. But I feel confident that I could wear these for an extended period of time. And my mom is one of those people who hates all shoes and practically can't wear them and I insisted she buy a pair and even she likes them. They're Reebok Skyscapes, by the way. Thank you so much for your feedback! They look soooooooooooo comfortable! Are they worn with or without socks? I don't know about you, but my feet sweat in flats and other similar shoes, so these would be an great alternative. Thanks again! Ok so I just wore them for like 6 hours without socks. I didn't notice any foot sweating at all. And even if there was some and I wasn't paying enough attention, these are the only pair of sneakers I could ever wear without Peds or socks of some sort. In all my other sneakers my feet get blisters or sweat way too much. So I am officially endorsing the Reebok Skyscapes haha. Visit Alison's profile on Pinterest. 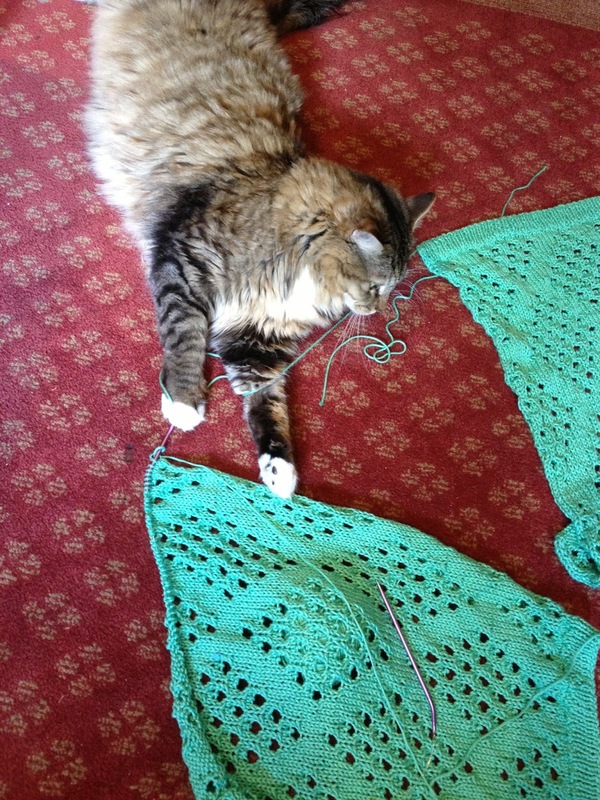 I knit, crochet, sew and have a big fluffy cat named Sox (after the Red Sox) who likes to help me with my crafts. I graduated from the University of Arizona in May 2011 with a B.A. in Journalism and I studied Fashion Design at Framingham State University in Massachusetts for two years. I now live in Lemoore, California with my husband who is in the Navy.